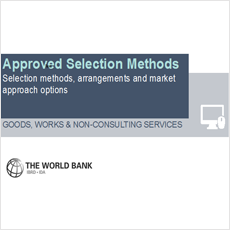 This presentation explores Approved Selection Methods (selection methods, arrangements and market approach options) for Goods, Works and Non-consulting Services (GWNcS). These Approved Selection Methods are described in the Procurement Regulations at Section VI and Annex XII. This covers the following: Selection Arrangements and their procurement processes, Process decision tree for practitioners, International v/s national market approaches, RFQ v/s RFB v/s RFP, SPD features e.g. ; BAFO, multi-stage, two-envelope etc.